This excellent course is generously provided free of charge for anyone in the Tendring area aged 17-20 who wants to improve their German language skills. It is an intensive language course held from 21 to 28 July (21st and 28th are travel dates). Travel to Memmingen (for Biberach) is fairly cheap if the tickets are bought in advance on Ryanair. Hosts will usually be available to provide transport and accommodation. 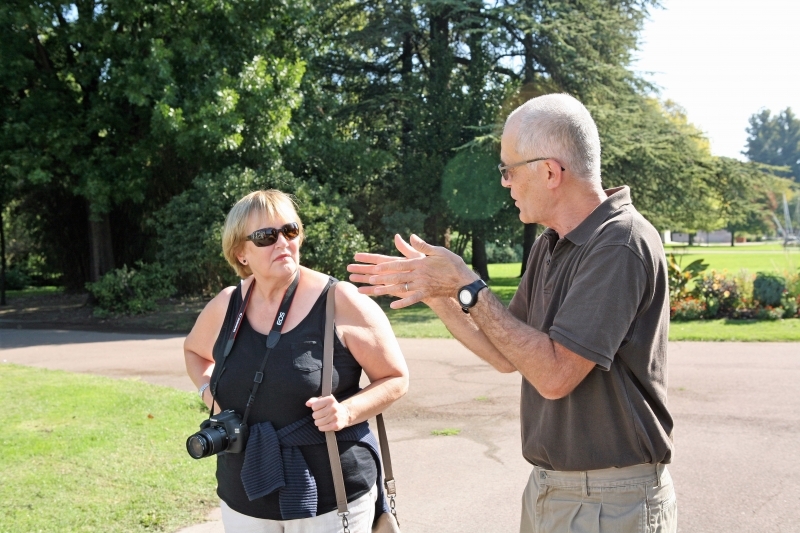 Please read all about the experience of our first student last year here (click to link). Contact Joy Phillips (TTA Chairman) for further information if you are interested. Happy new year to all our readers! 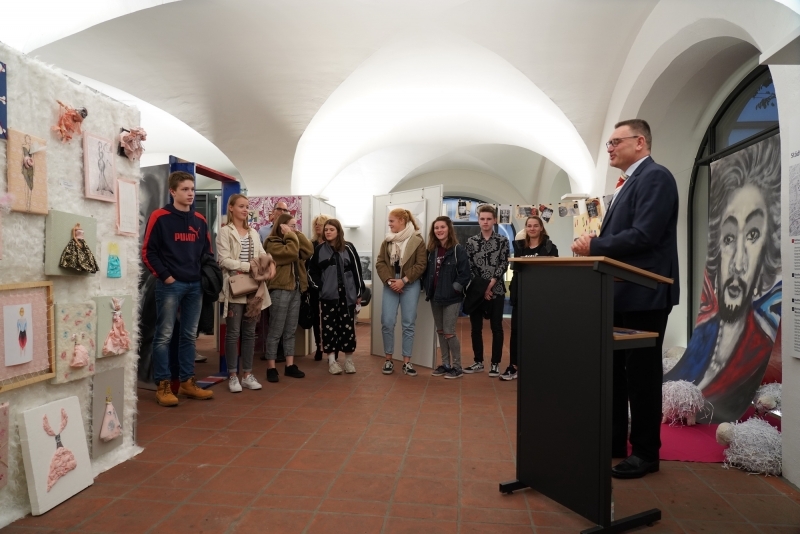 We had another great year at the Biberach Christmas Market, fundraising, renewing friendships and strengthening the bonds of twinning. We had some very interesting and enjoyable conversations with visitors to the stall, all keen to speak to us about life “at home” and to share their hopes and best wishes for the future. Helen and I were on the Tendring stall over the last weekend from Thursday to Sunday (13-16th December) . This meant having the pleasure of offering interesting last-minute Christmas shopping to many of our customers and the disappointment of sending others away empty-handed when no more lemon curd, chocolate orange or whiskey marmalade could be found. The weather was pretty bracing each day, with a nice dusting of snow on Sunday morning. 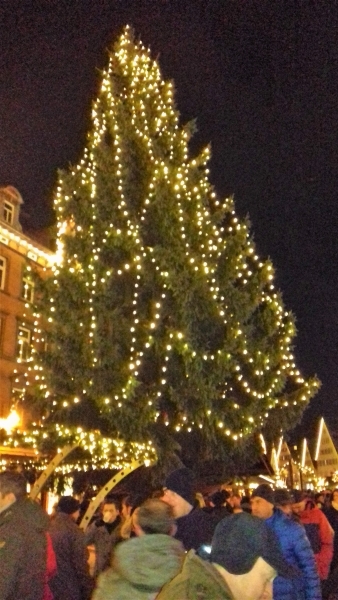 Luckily for us we had the steaming Gluhwein stall next to us and the heat of the Dampfnudel bakery opposite. The market in full swing! Christa, Stephan and Marianne were our attentive and very generous hosts, keeping us warm, well fed and safely transported to and fro. 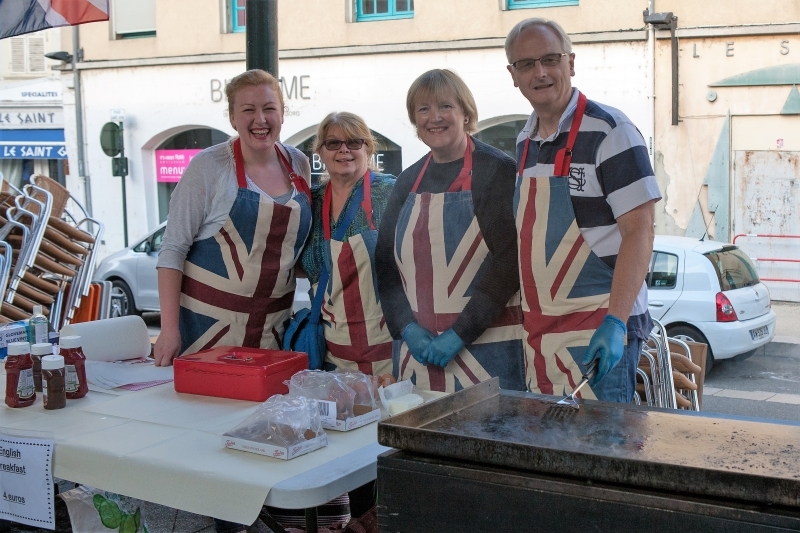 Other members of Biberach town twinning were as always ready to cover the stall whenever no-one from Tendring was available, and our grateful thanks go out to them all. Best wishes to all in 2019 from Richard & Helen. 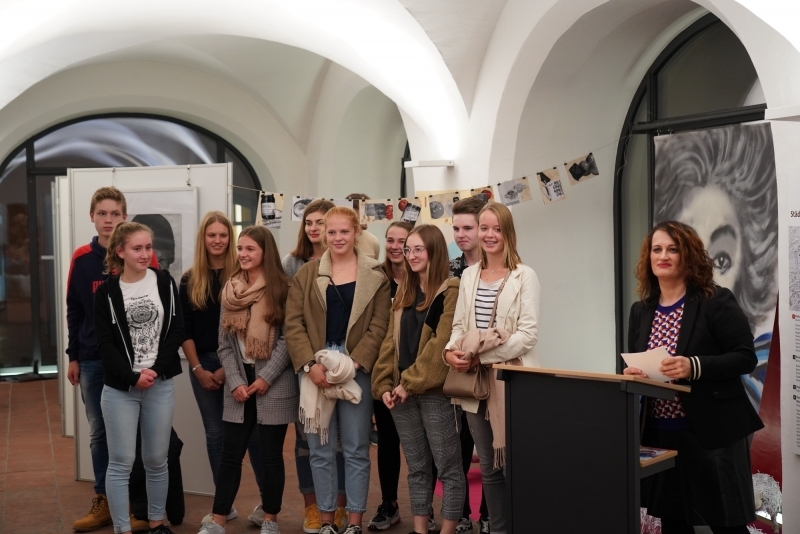 English Week in Biberach is a misnomer! Such is their enthusiasm for all things English that it ran from Friday, 5th October and finishes Tuesday 6th November. Adrian and I went for the first weekend when Adrian came back home and I stayed until Wednesday 17th. Sue and Keith also came for the first weekend and went home on Tuesday. Mary and Sharon came over for the second weekend. Our time in Biberach was made all the nicer as the weather was superb. 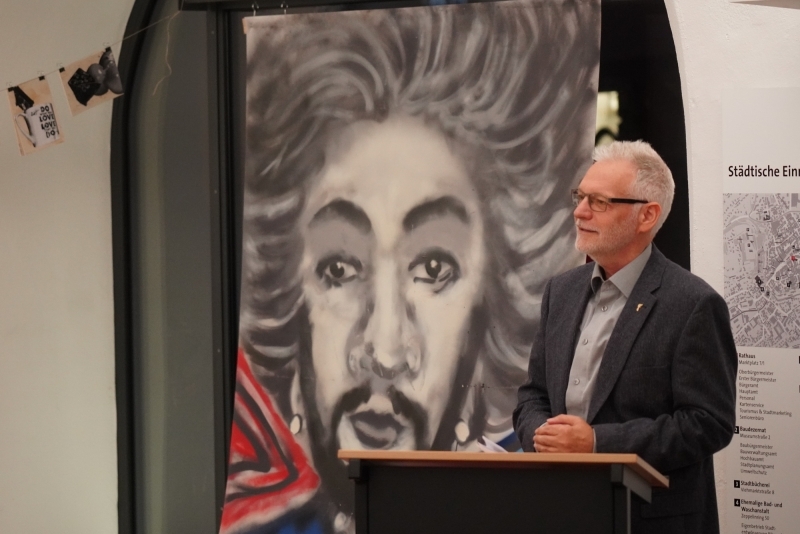 We were officially welcomed by Norbert Zeidler, the mayor of Biberach on Friday 5th and then we dine together. 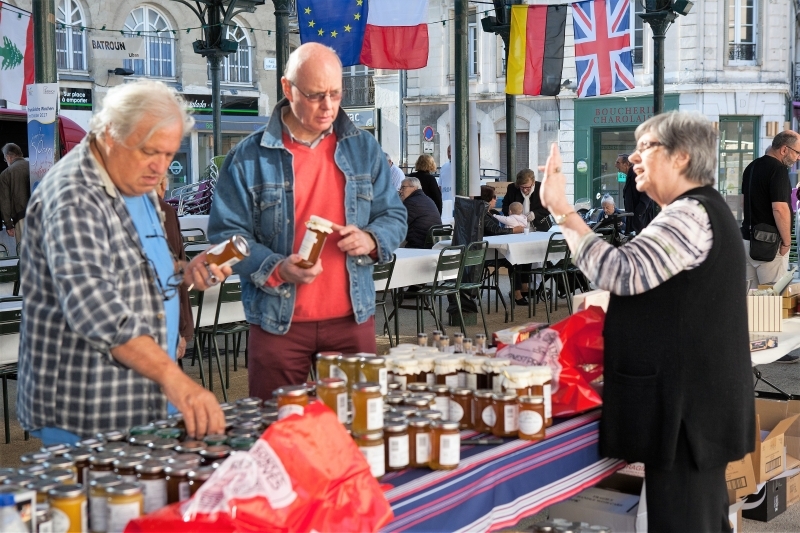 On Saturday our market stand was manned by the Germans as we didn’t take the van over – we sold our products well and has helped our finances. The Saturday evening was a wonderful ‘English’ meal followed by pipers and dancing. On Sunday evening my hostess Anne and I went to the pub to participate in the English Quiz. It was so full that not all those who wanted to could get in. Thank you to Rachael for her wonderful questions. Monday evening there was an English film on at the town’s cinema – it was called ‘Venom’ and probably not a film I would go to see normally, I did however thoroughly enjoy it. It’s good sometimes to step outside our comfort zones and do something we wouldn’t normally do! 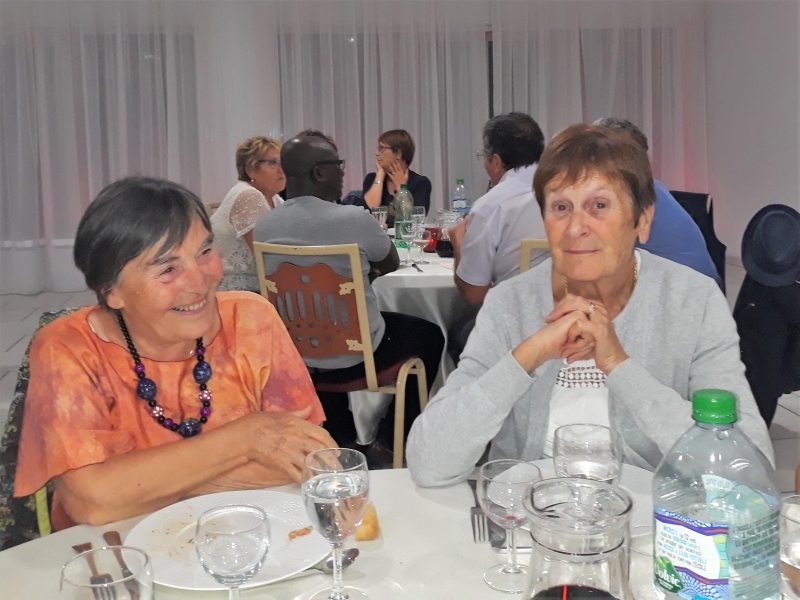 Club night on the Saturday evening was enjoyed by Mary and Sharon – I wasn’t able to go as I didn’t have transport, but I do hear on good authority that it was a really good evening. Sunday was our English cream tea afternoon with some very able dancers showing us their skills. Unfortunately the weather was beautiful and more people went out walking and bike-riding. Consequently there were only about 30 of us. Of course that meant that some could have extra scones! Although not well-attended we had a lovely time watching the dancers -both professional and not and drinking English tea. Another Monday evening and another film: this time it was ‘A Star is Born’ and was about the history of Lady Gaga’s rise to fame. We enjoyed this – especially with our popcorn and coke! 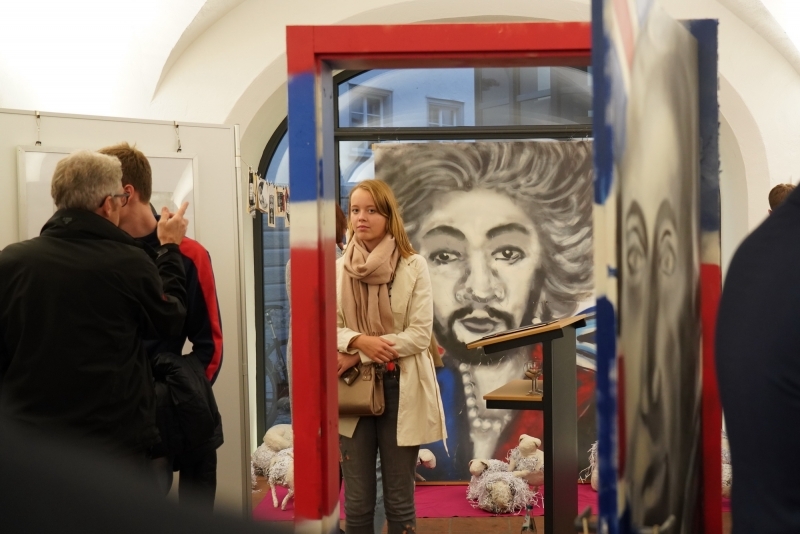 Tuesday was my last activity and was Romeo and Juliet performed by and English-speaking company of actors. 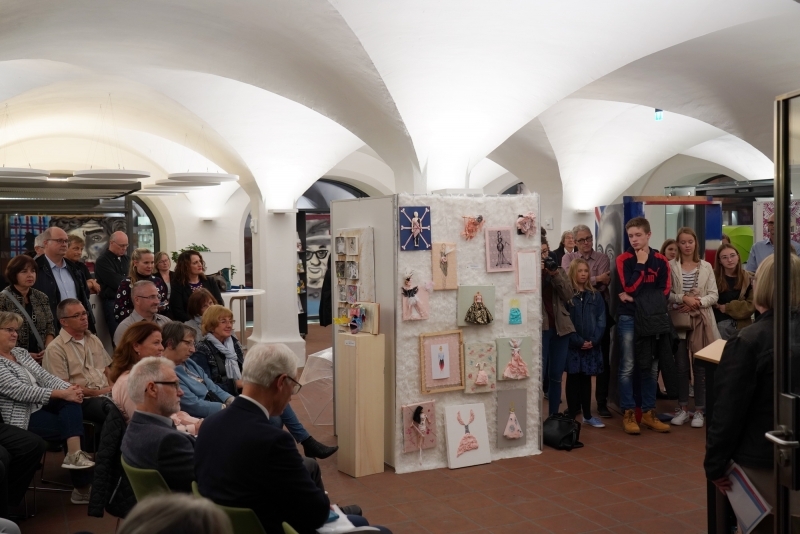 This was well-attended especially by the young students in Biberach. My goodness! It was done in Shakespeare’s English – the youngsters didn’t make a sound, but many of the adults found it difficult to follow. 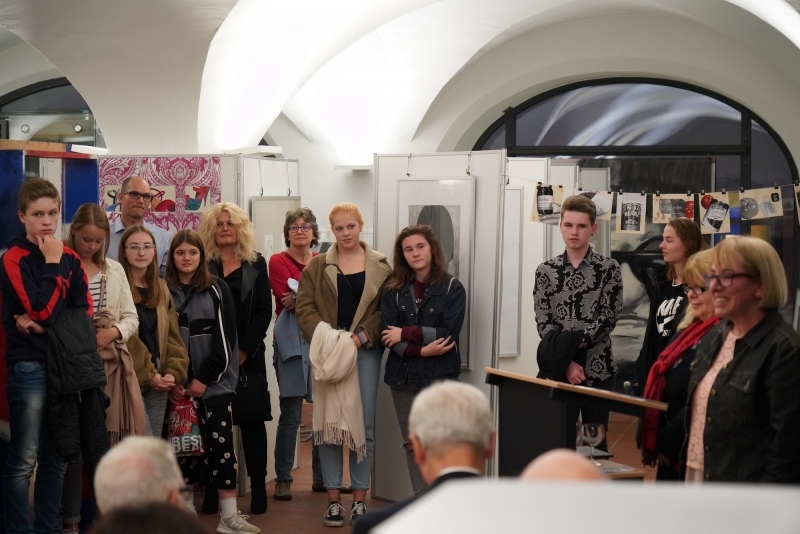 I had a wonderful time in Biberach – English Weeks can stay! Thank you to all of you who worked so hard to make each and every experience memorable and a pleasure to attend. Calling all twinners – old members and new members! 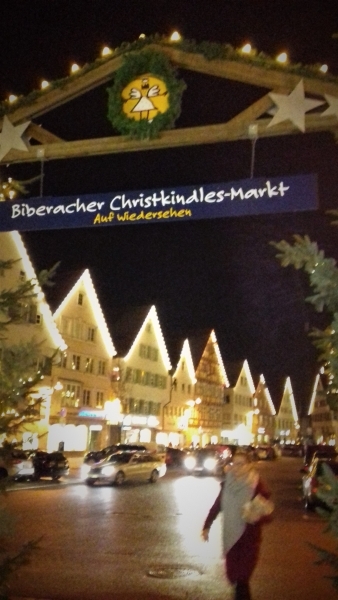 We will need help with TTA’s stall at the Biberach Christmas Market. It will be held from the 1st to 16th of December this year and help will be welcome on various dates. We usually fly from Stansted to Memmingen with Ryanair. From when we arrive to when we depart we are well looked after by our Biberach twinners. If you would like to go please contact Joy either by using the Contact on this web site or email. It’s a great opportunity to help our association and also to make new friends or renew old acquaintances. 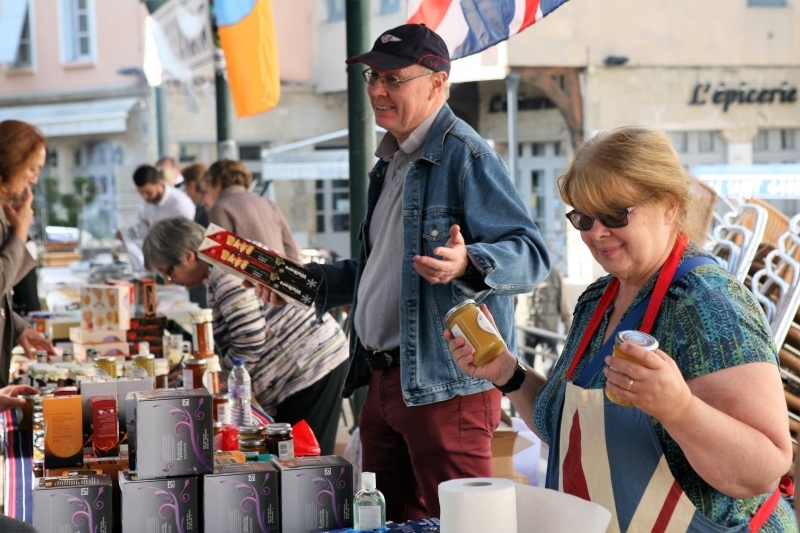 This year the International Market in Valence was held on the 22nd of September and the TTA took over the van loaded to the gunwales with products from our area and wider afield. Carol and Bert travelled in the van whilst Adrian and I flew to Grenoble and hired a car. 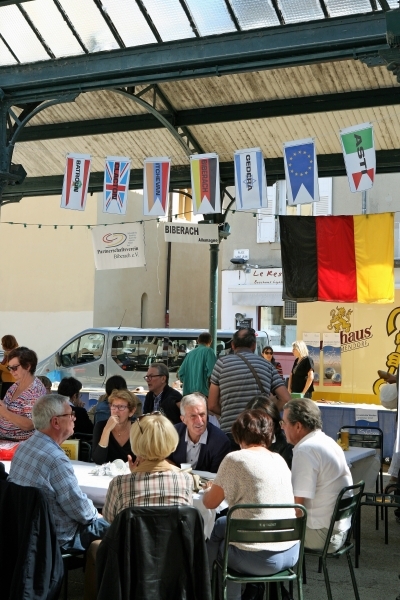 This is the 3rd year we had had the market on the same weekend as ‘la Fete de la Gastronomie’. Our experience has varied year to year and this time we had a lot more music, with singers and musicians and we drew quite a good crowd. Our stand did well and there were many old friends to chat to and new friends to be made. Carol had done an excellent job of choosing what we would sell, and we made a good hole in our produce. 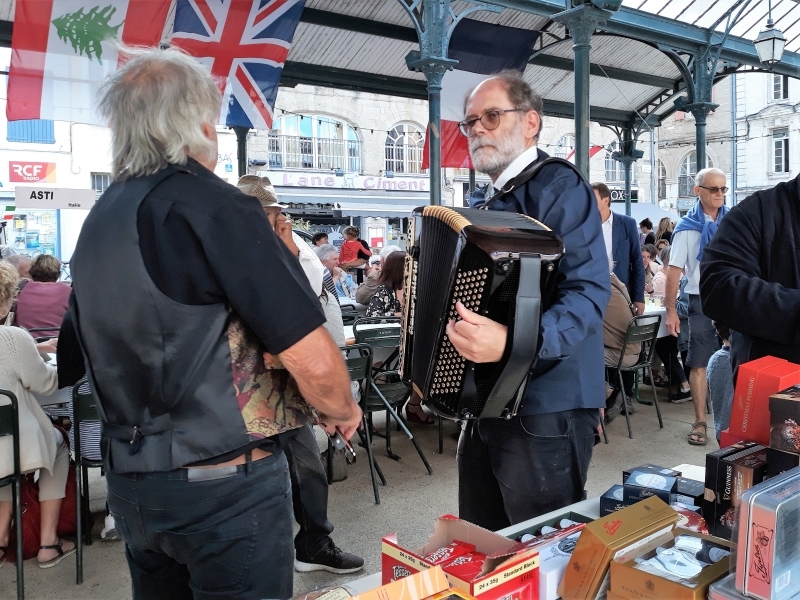 Bert was kept busy in his customary role as ‘sales advisor’ telling all clients what his personal favourite is and convincing people to purchase. This year we did not take the ingredients to sell English breakfasts. Adrian was kept busy on the stand, taking the money from Bert’s conquests. Our photos show that we displayed our children’s work. 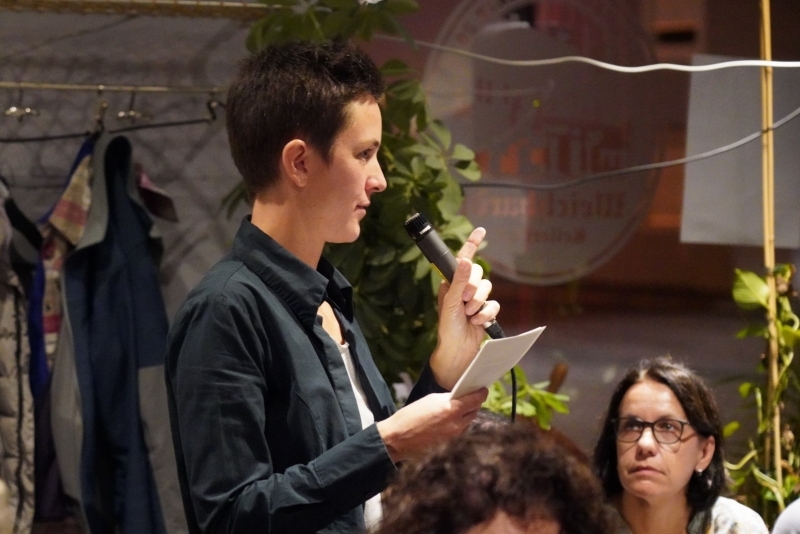 This was from the end of March in coordination with the Essex Book Festival. 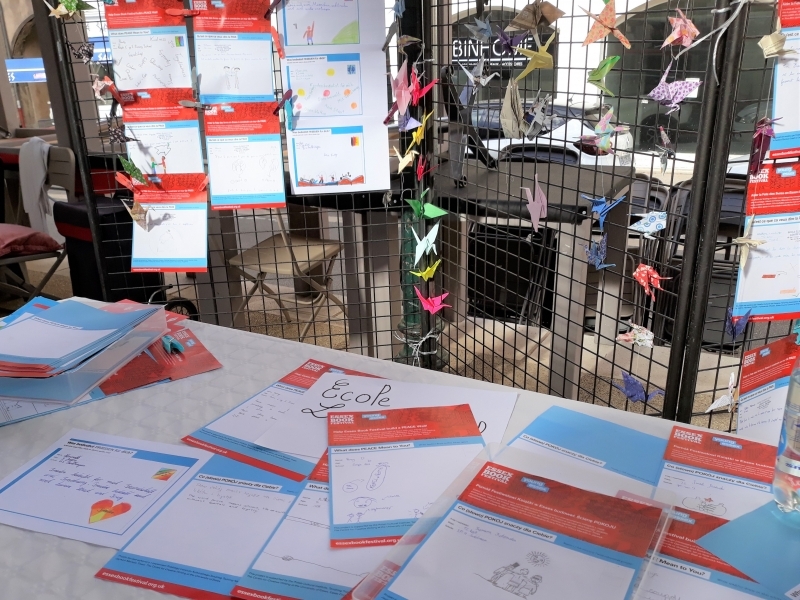 One of the schools from Valence contributed, and there was a lot of interest in their replies from ‘What does PEACE mean to you?’ Next year we will be continuing to work with the EBF hopefully with some schools the same and others joining in. Of course the question will be different. 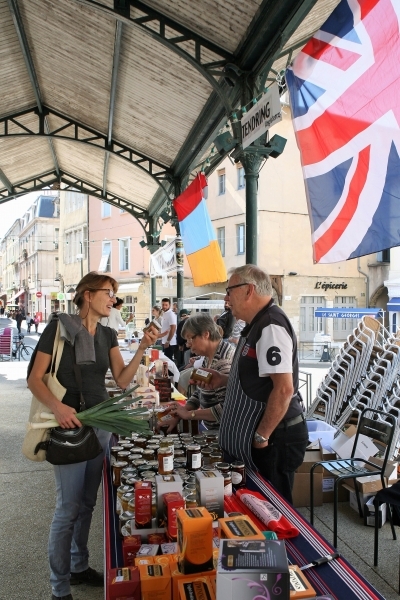 The market is only part of the experience when we get together in Valence. 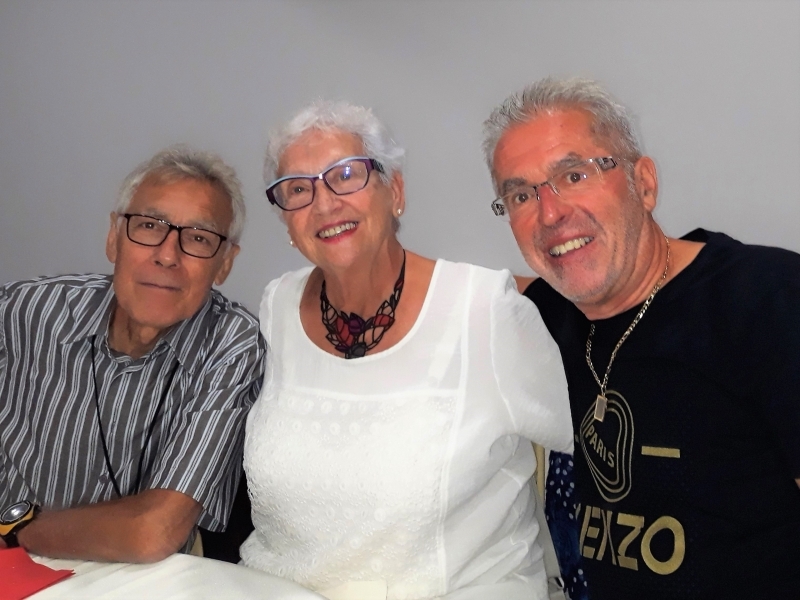 On the Saturday evening we went to eat and dance together with all the other twin towns. 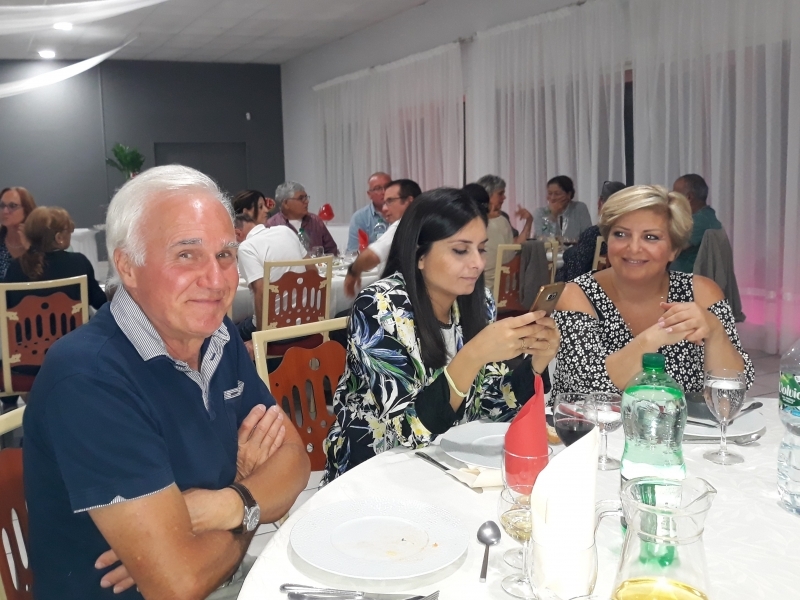 It was a lovely meal and a great opportunity to relax and enjoy being a part of Twinning. 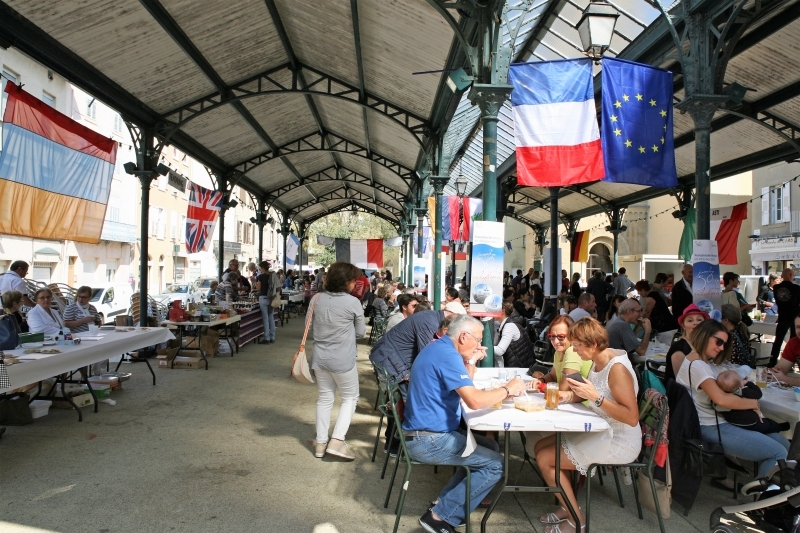 On Sunday morning, having been given some tickets, we went to experience ‘la Fete de la Gastronomie’ for ourselves. I’m not sure I can use sufficient superlatives to tell you how wonderful it was! 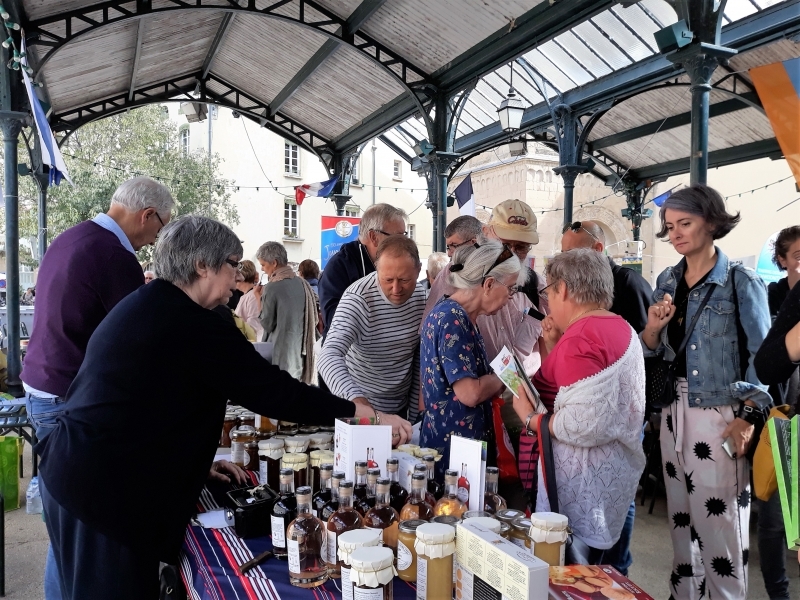 We began by looking around cheese stalls which was great – when suddenly we were attracted to a stand providing Cantal beef with Cantal potatoes. We had never eaten something so delicious! Then we crossed the road into the rest of the Fete and ate three desserts each, got a bottle of lovely fruit juice, drank a beer and watched a top chef cooking. What an unexpectedly wonderful experience! 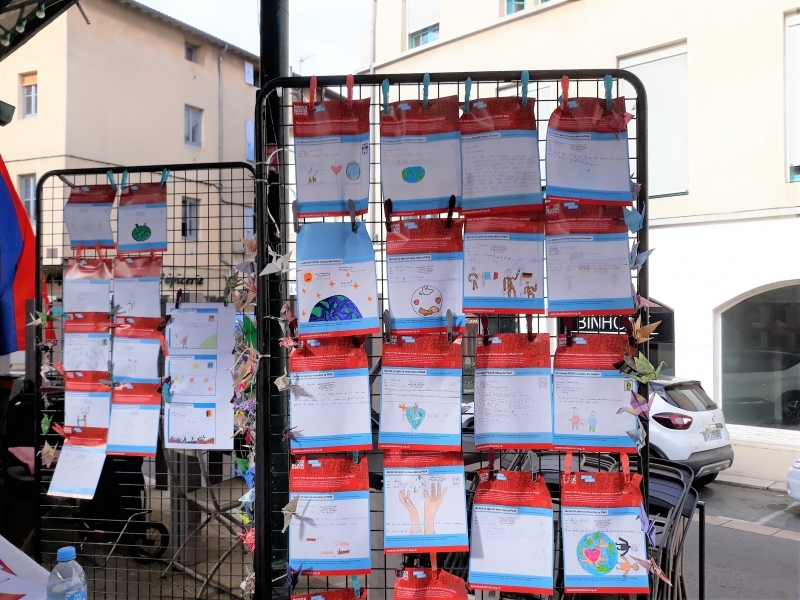 Thank you to those in Valence who gave us the tickets – your generosity was much appreciated. 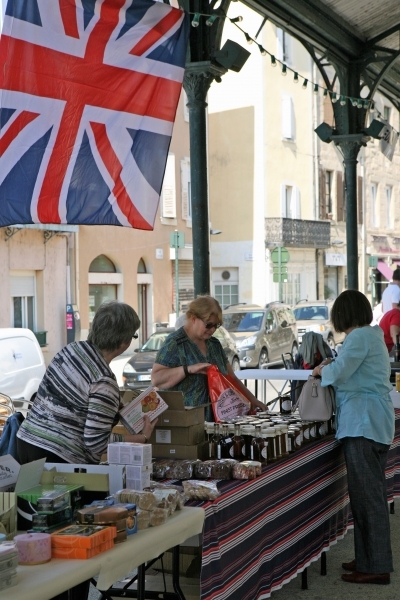 We flew back on Monday having done the market in Valence, but also having had a great time experiencing so many other things as well! 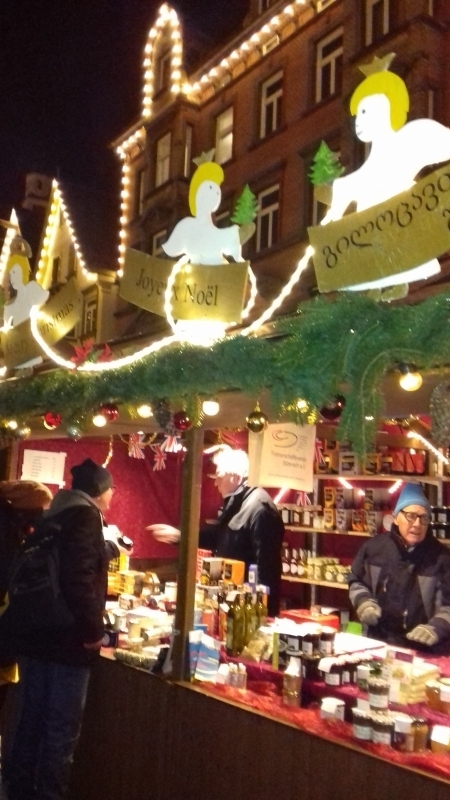 A number of enthusiastic TTA volunteers again made sure that our Christmas market stall in snowy Biberach was a great success. Whilst the festivities may seem a long time ago, wintry weather is with us again this February so a few pictures from the market do not seem quite so out of place. 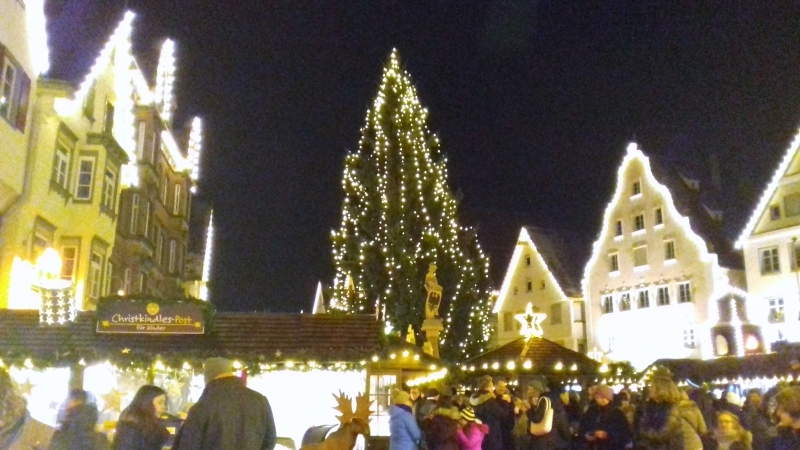 This was my first visit to Biberach in winter, for the final weekend only and all too brief really. Helen and I stayed with Christa and Stephan whilst Sue and Keith were with Petra. 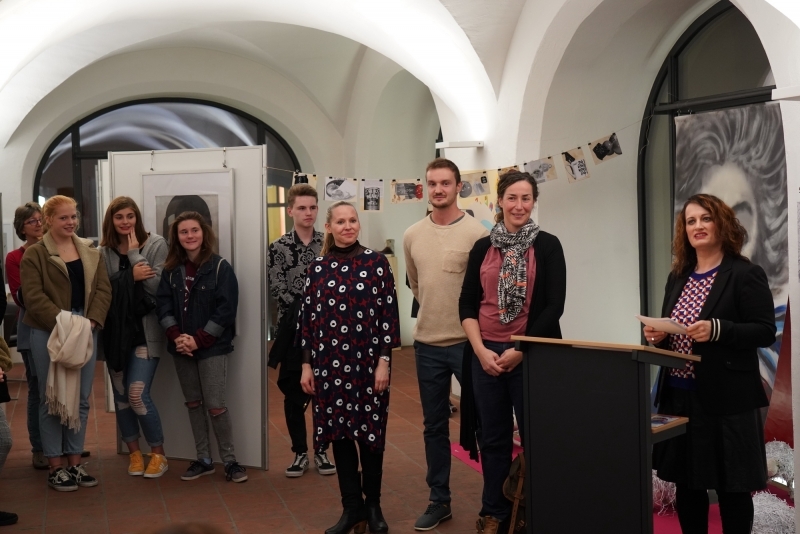 As well as enjoying great hospitality and friendship from our hosts and other Biberach twinning supporters, we had a lot of fun on the stalls with our friends from Valence and Asti. We even fitted in a brief visit to Ulm. Memorable sights for me were the life-sized nativity stalls with live sheep and donkeys, giant steaming dampfnudel served on paper plates with plum and vanilla sauce, and at least thirty varieties of mulled wine and cider. Most frequently requested items on our stall this year were Terry’s Chocolate Orange, Wilkins marmalade with whisky (had to be with whisky!) and Wilkins lemon curd. We were also asked how to cook Christmas puddings and then to explain why it was necessary to set fire to them. We did our best…. Best wishes from Richard, Helen Keith and Sue. Saturday 11th November saw the annual CVST Christmas Market take place in the Town Hall. 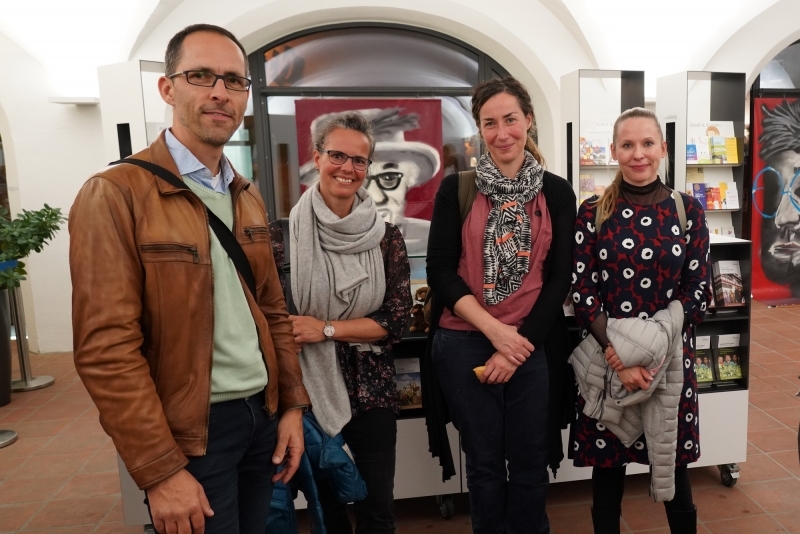 TTA members hosted visitors from Świdnica in Poland and Biberach in Germany. 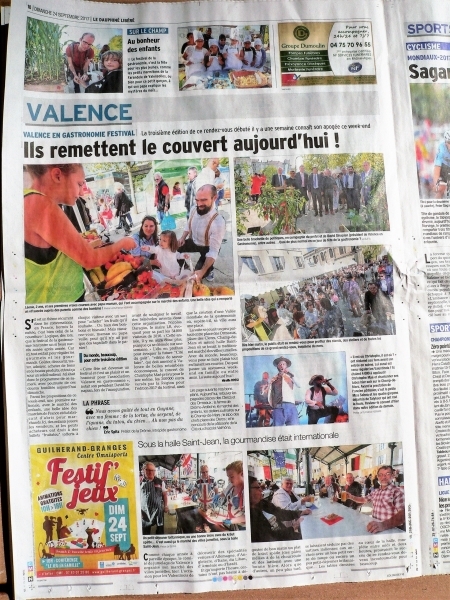 Sadly, this year, no visitors from Valence were able to attend. With our visitors arriving on Friday, the early evening was spent preparing the stall for the following day’s market. This was soon done and the rest of the evening was spent with their hosts. 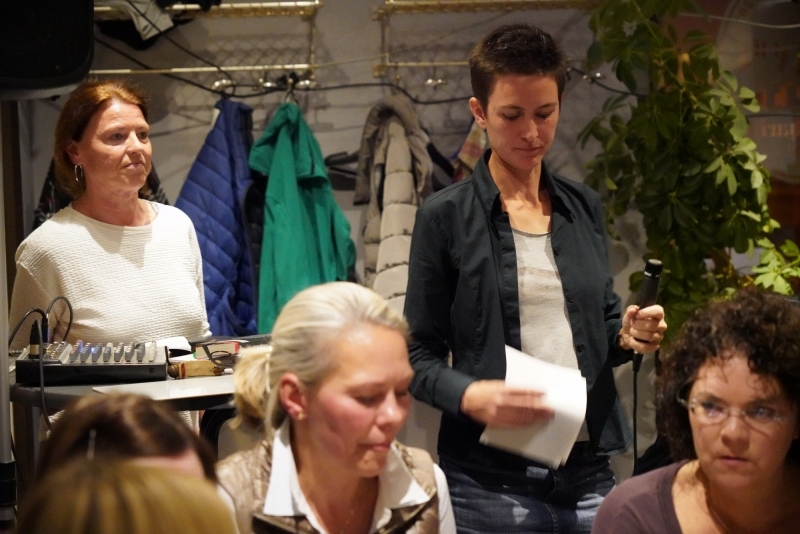 Petra and Sarah enjoyed an Indian meal at the Blue Sari – especially appreciated as it seems Biberach doesn’t have an Indian restaurant. Saturday was a busy day, selling produce, being photographed, renewing old friendships, shopping in Clacton and, when the market closed, being hosted, in the inner sanctum of the Town Hall, by the Chairman of the Council, Mark Platt and his wife. Mark entertained us all by producing a number of objects, books and certificates relating to twinning over the years that he had unearthed in various council offices, with a view to having them on more permanent display. 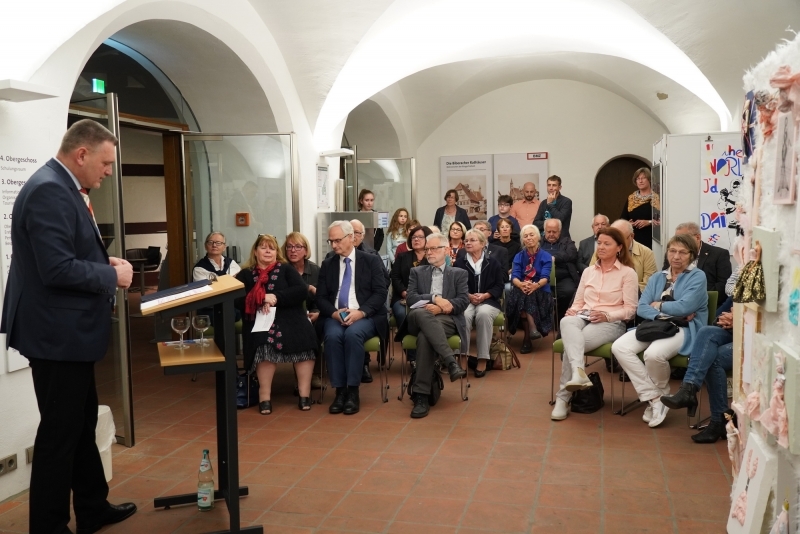 He also admitted to, on his first visit to our German twin town, driving to the ‘wrong’ Biberach before finally arriving in Biberach-an-der Riss! 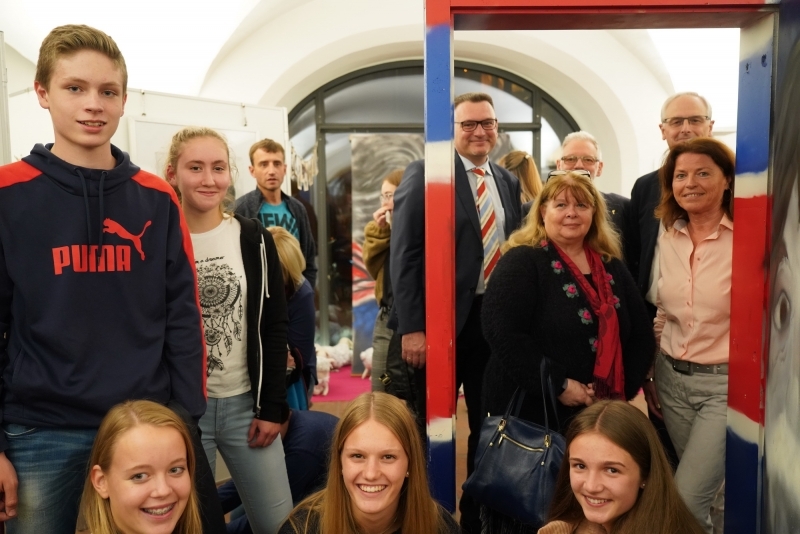 He impressed our Polish visitors by pointing out a painting of Świdnica in the background of his official portrait. 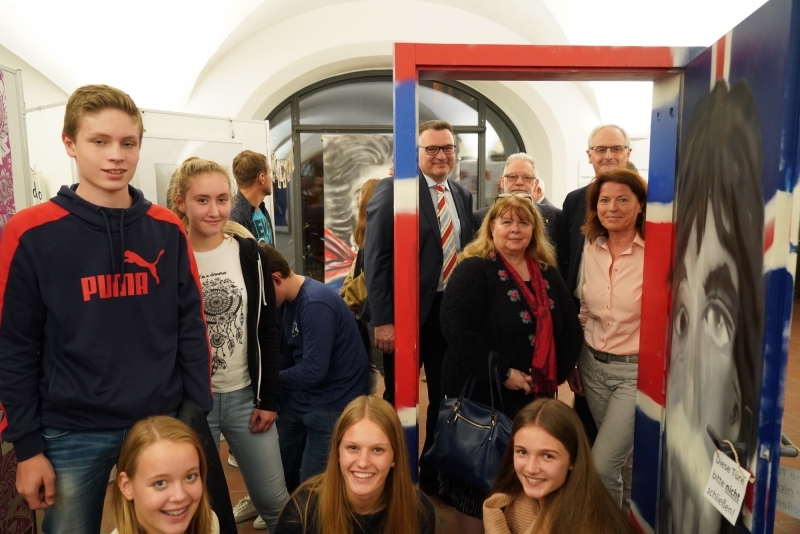 It is very encouraging to see Mark’s support and enthusiasm for town twinning. Saturday evening was an opportunity for more members of the TTA to come along to the Martello Inn to join our visitors and hosts for dinner and a very noisy and sociable evening was had by all. On Sunday our visitors spent the day with their hosts visiting various local places, shopping in Colchester and Norwich always being popular destinations with Christmas looming. All too soon though, Monday morning arrived and, with a very early start, our visitors were off home again – until the next time. 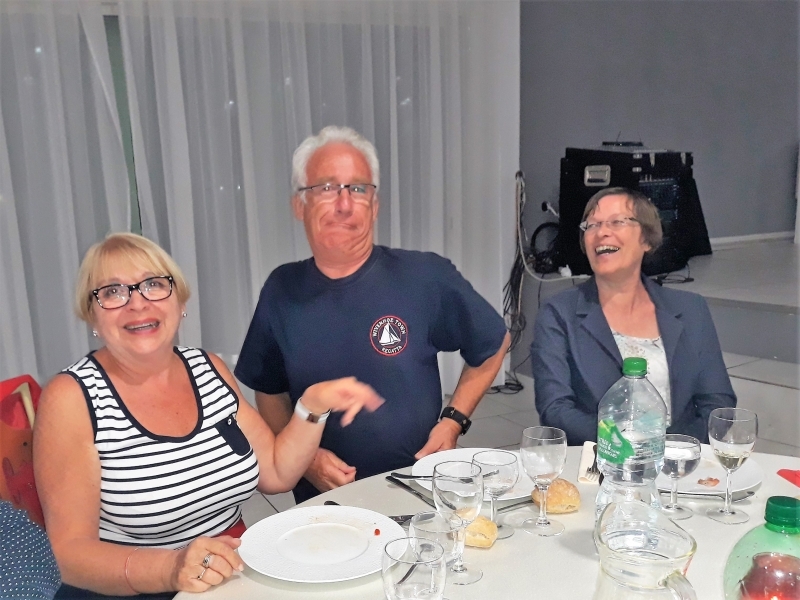 Kerith & Teresa visit Valence for the first time…. On a chilly September morning Kerith and I set out on a journey to Valance. Our mode of transport depended on Joy and Adrian Phillips. They had kindly invited us to accompany them on the journey. 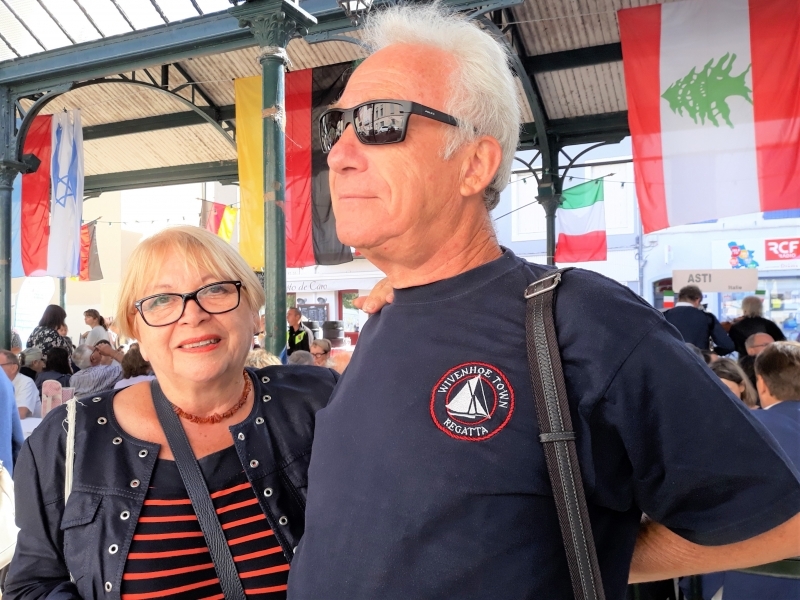 At this point we would both like to commend Adrian for his sterling efforts to get us to the south of France at the quickest of times, without breaking any land speed records! He was a star. Never complained and made sure that we had enough ‘comfort’ stops, as requested on many occasions. 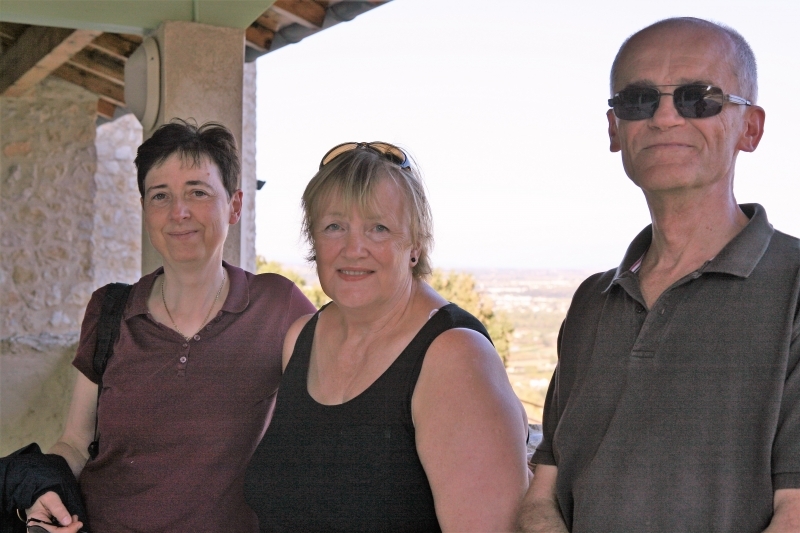 As we drove down towards the south of France, the weather became increasingly warmer – certainly not the temperature that we had left behind! On our arrival we were introduced to our hosts, Claire and Yves. 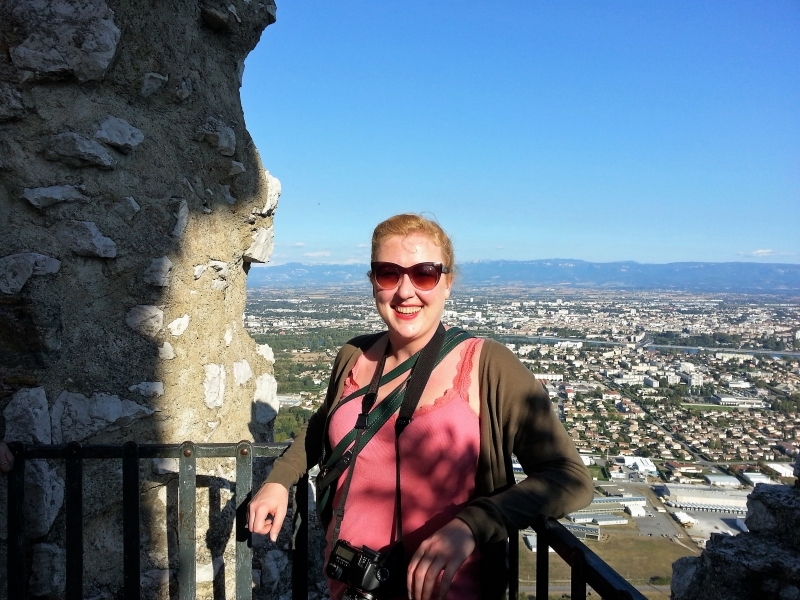 We couldn’t have asked for a better example of French hospitality than was given to us, by them, throughout our stay. After a lovely meal we retired to our respective rooms for a welcome rest. 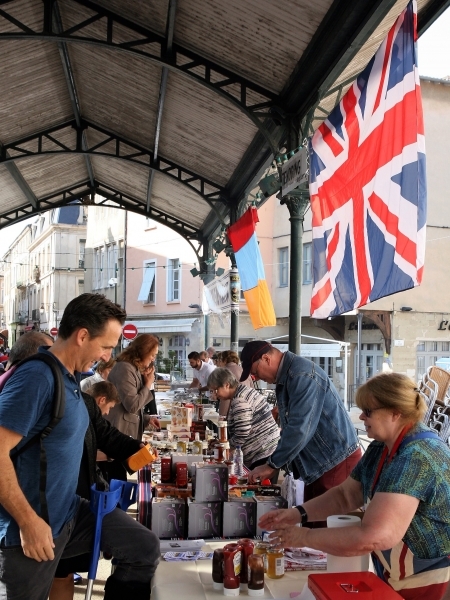 The next morning, following a hearty breakfast, we wandered through the town to meet with other twinners at the Valence market. It was such fun! The various nationalities engaged with each other in an extraordinary display of friendship. We feel that this, in essence, is what Twinning is all about, breaking down borders of communication and making new friendships. The day was a huge success. 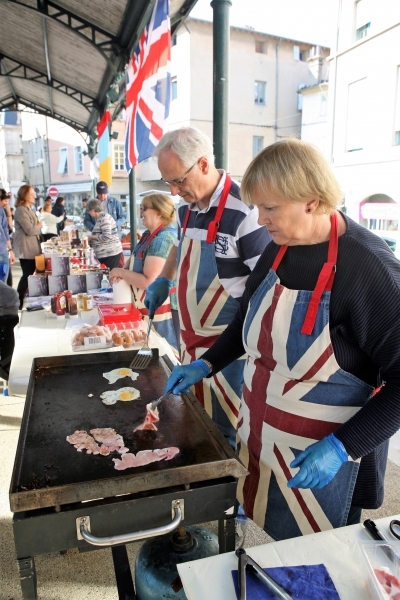 We were tasked to assist Adrian in producing a typical English breakfast – Bacon and egg sandwiches! Adrian no doubt was a street seller in another life as his talents for sealing a breakfast deal were so impressive! Again the focus was on fun and sellers, producers and customers enjoyed every aspect of it. 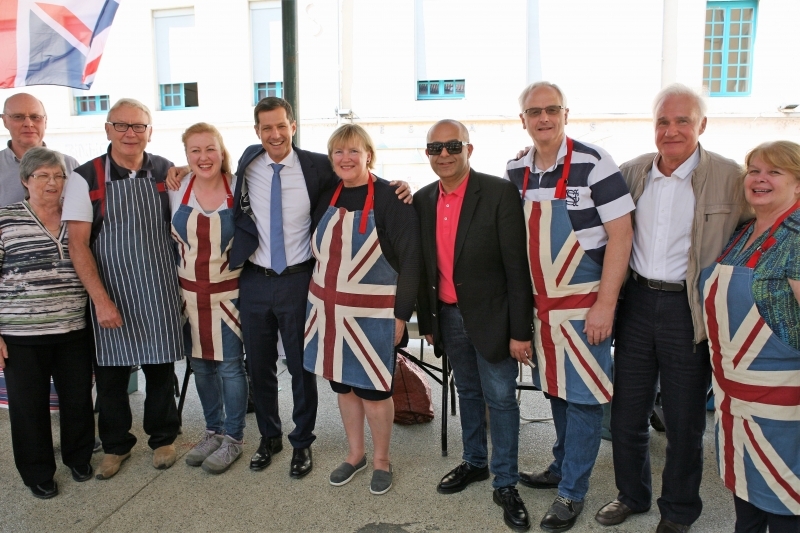 Another bonus was the opportunity to have our photograph taken with the Mayor of Valence. 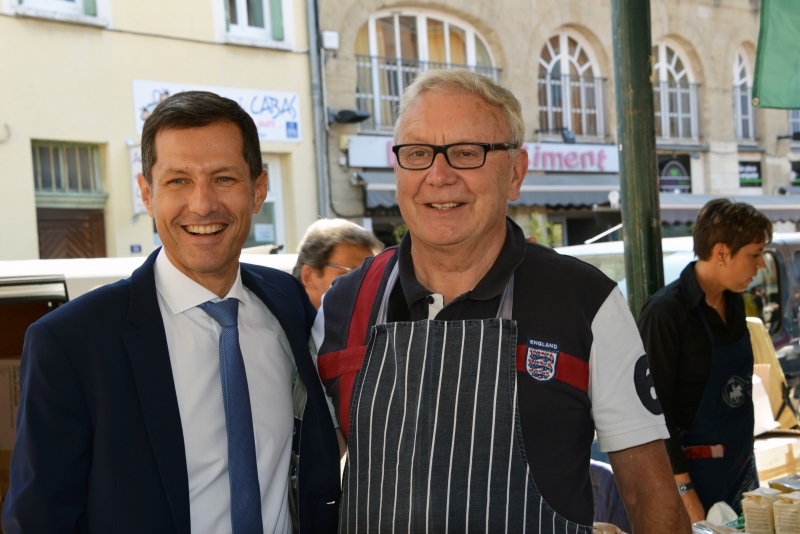 He was incredibly supportive of the event and stopped to chat with all stallholders during his visit. 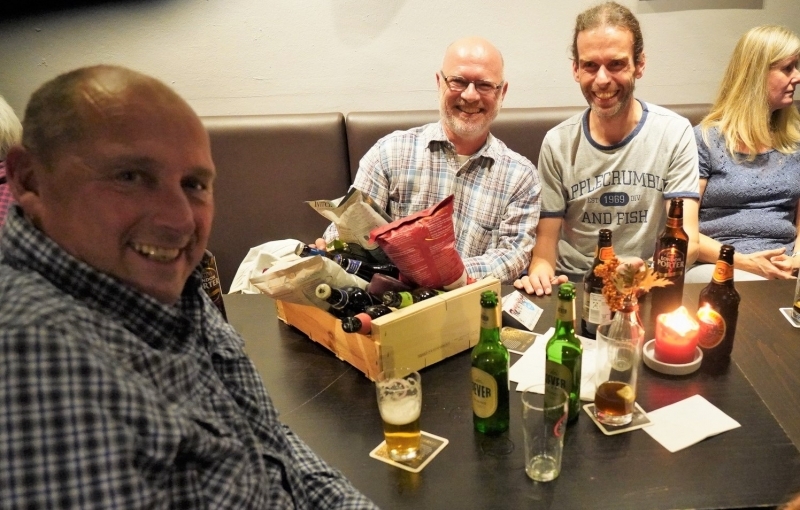 Once the breakfasts were finished, we could then sit back and celebrate with a cool German beer – bought from our twinning friends from Biberach. We then wandered off through the medieval city for a little sightseeing. 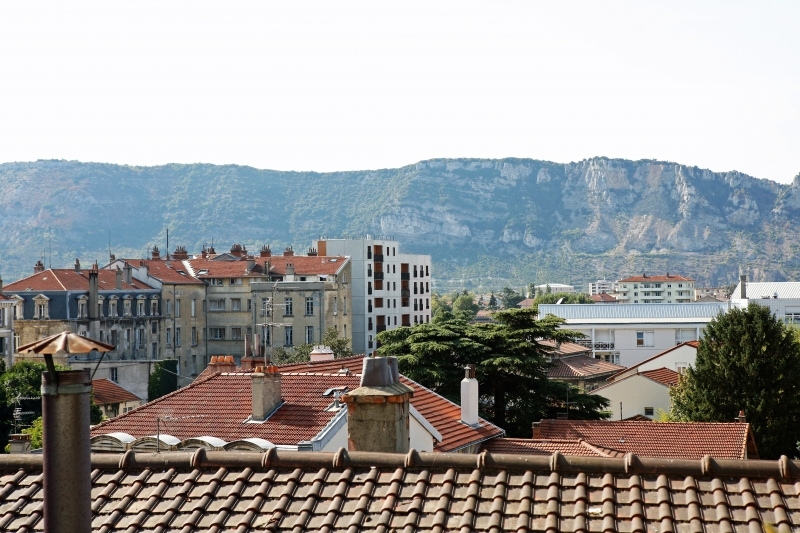 Valence is a beautiful place, so full of history, set within the backdrop of the Rhône Alps. 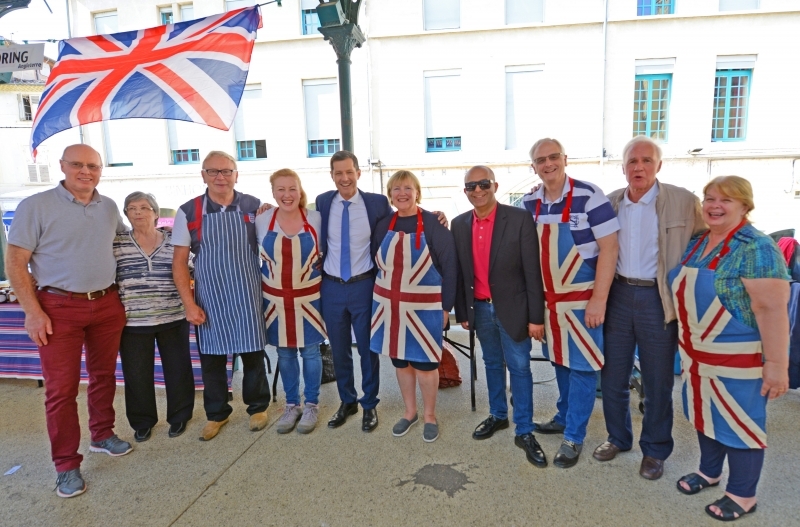 In the evening we were invited to a twinning event, hosted by our Valence counterparts. 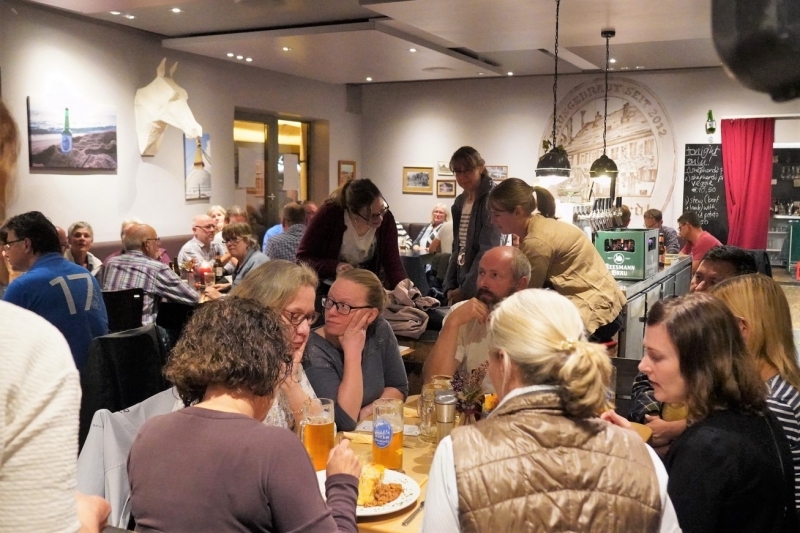 We enjoyed meeting new people while conversing over a 5 course meal – which was delicious. 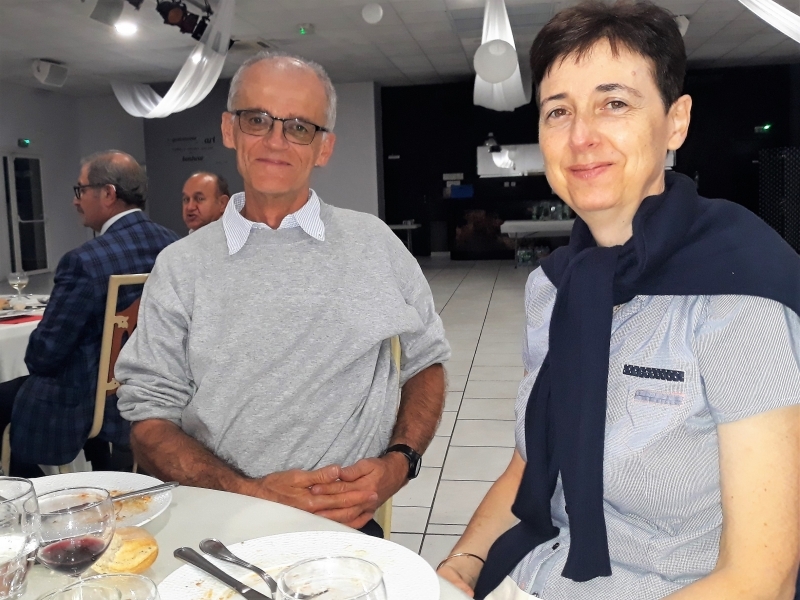 The next day we visited the local park, enjoyed yet another lovely meal, presented to us by our hosts, followed by a trip to see the ruins of the historic Chateau de Crussol. Early the next day, we thanked our hosts for such a wonderful time and set off for England. Of course we had to take in the delights of a French shopping trip in Calais on the way. Again, Adrian didn’t let us down and we arrived back safely in Tendring, that evening, via the Channel Tunnel. 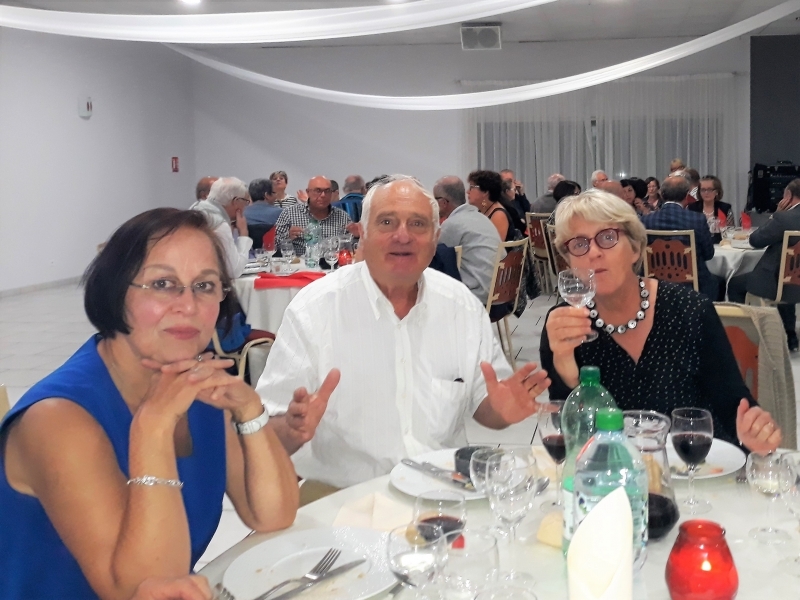 It was a wonderful weekend which we would recommend to anyone contemplating the joys of the Twinning Association. 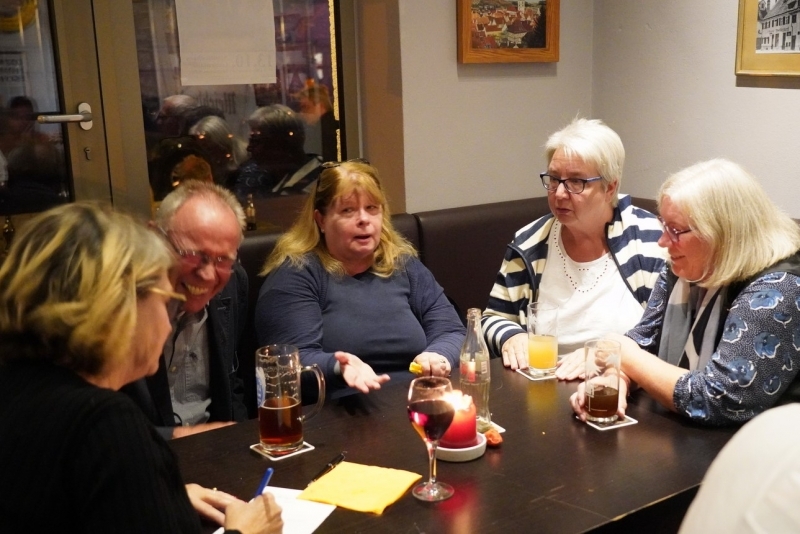 “When I was offered by the Tendring twinning association the chance to take part in a free German course in one of the oldest towns in Germany, I couldn’t pass up the opportunity. 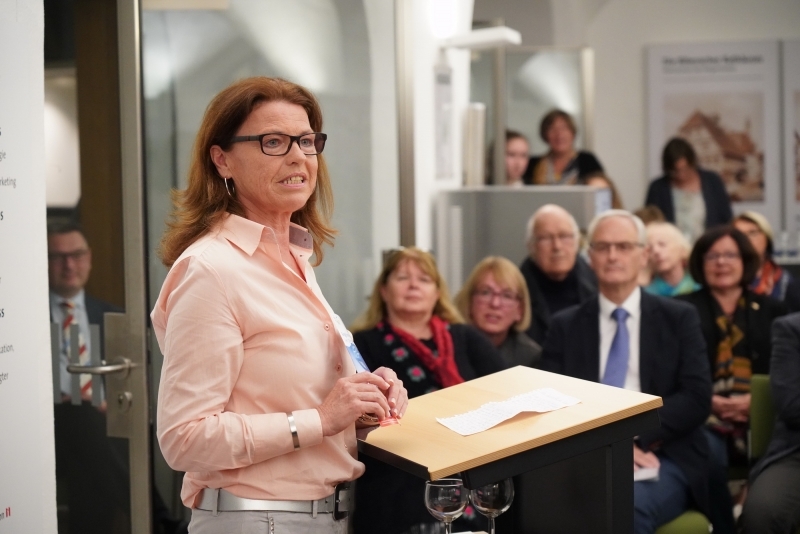 Having studied German for the majority of my secondary school experience, including A Levels, I believed the course would be perfect for me, and I wasn’t wrong. 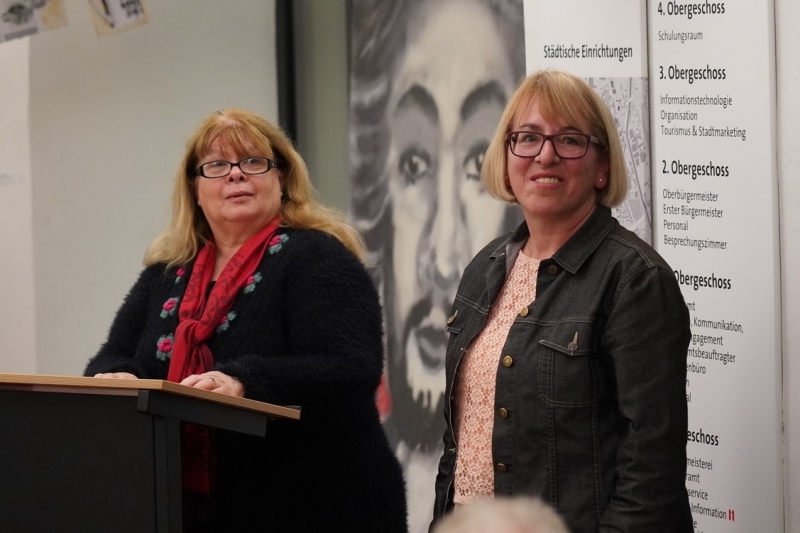 Biberach definitely lived up to the expectations I had conjured from others’ experiences, providing me with an extensive insight into the life and culture of swäbisch Deutschland. 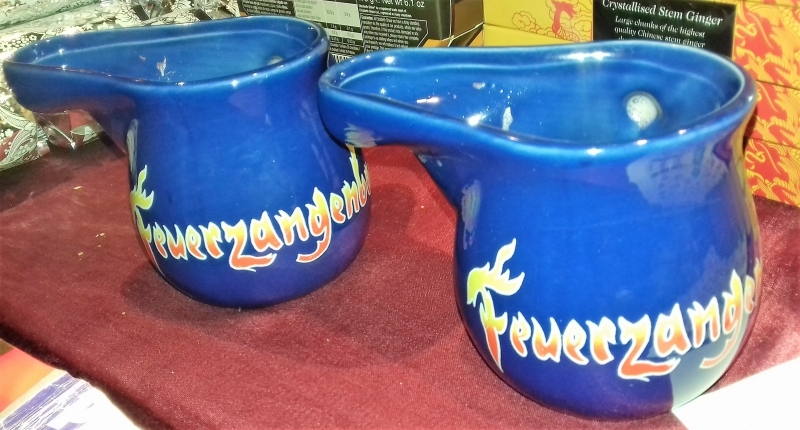 I was thrown straight into the town’s culture by arriving on the weekend of Schutzenfest; a traditional German beer festival celebrating Biberach as a town. The course having booked front-row seats for the History rally, our group was lucky enough to witness a truly incredible part of southern German tradition. To receive notifications by email every time a news update appears on this website just enter your email address in box 1 below and then click button 2. You can unsubscribe at any time.